Few things can bring a family together like a good meal. 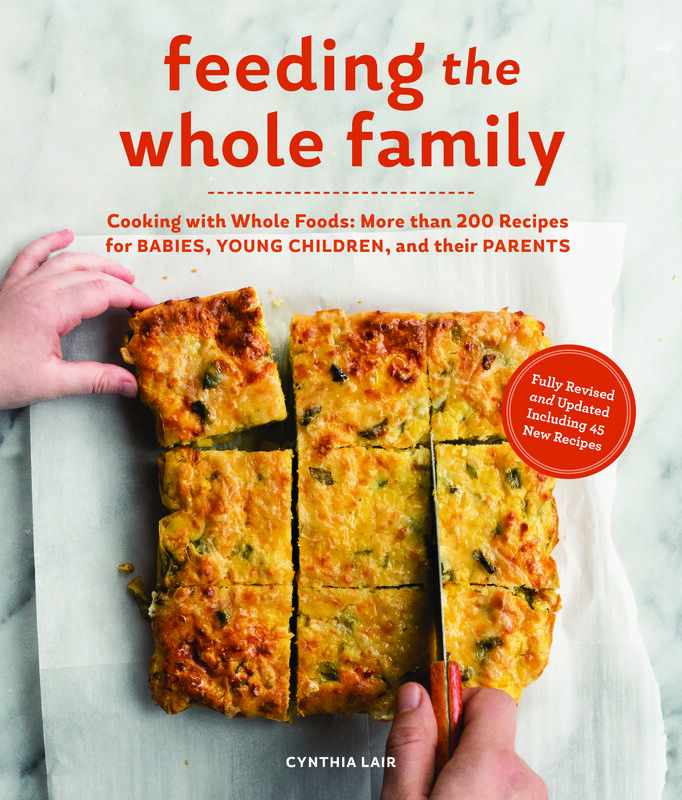 In the spirit of hearty, happy eating this fall and winter, we're sharing select recipes from Feeding the Whole Family: Recipes for Babies, Young Children and Their Parents by Cynthia Lair. Lair's cookbook has been a go-to for families for nearly 15 years, satisfying even the pickiest of eaters and making sure everyone leaves the table satisfied. Read on for two of her delicious meals! Jeff Basom was the chef for Bastyr University’s renowned cafeteria for over a decade. I wouldn’t know half of what I know about whole foods cooking, including this yummy method of pancaking potatoes, had it not been for Jeff’s tutelage. Serve with apple sauce (homemade recipe on page 376) and cultured sour cream. 1. Bring an 8-quart pot filled with water to boil over high heat. Add the potatoes and 1 teaspoon of the salt to the boiling water and boil until they are nearly done — when pierced with a fork, the center will still feel slightly undercooked — 6 to 8 minutes. 2. Cool the potatoes until you can easily handle them. Peel, then grate on the largest holes of a box grater. You should have 4 to 5 cups of grated potato. Put them in a large bowl and set aside. 3. In a large skillet over medium heat, add the butter then onions and sauté until the onions turn golden, about 6 to 8 minutes. Reduce the heat to low and slowly stir in the flour. 4. Add the onion-flour mixture to the grated potatoes. Mix in the remaining 1 teaspoon salt a little at a time to taste. Add the pepper. In a small bowl, whisk the eggs. Fold the eggs into the potato mixture until even. With your hands, form the mixture into twelve 3- to 4-inch patties. For babies 6 months and older: These latkes are delightful served with homemade applesauce (page 376), which can be served to baby. This unique pancake has no flour or wheat but uses highly digestible soaked whole grains. A former student, Ronit Gourarie, adapted this recipe and routinely served these beauties to her son, Ben, every Friday. Homemade Applesauce (page 376) or Strawberry-Blueberry Sauce for Pancakes and Waffles (page 374) on top add color and natural fruit sweetness. 1. In the bowl of a blender, combine the water, oats, yogurt, and buckwheat groats. Cover and let soak overnight for 6 to 8 hours. 2. Add the egg, sugar, baking powder, nutmeg and salt to the soaked grains and blend on high until smooth. 3 Preheat a griddle or frying pan and lubricate with oil. Pour about ¼ cup batter per pancake onto griddle to form each pancake. Cook for 2 minutes. When tiny bubbles form and the edges of the pancakes firm up, flip them with a spatula and cook the other side for about 2 more minutes. Repeat until all the batter has been used. 4. Keep the cooked pancakes warm in the oven until ready to serve. *(c)2016 by Cynthia Lair. All rights reserved. Excerpted from Feeding the Whole Family by permission of Sasquatch Books.